PRQ Raid Targets Revealed, Pirate Party Gets Boost, Plot Thickens…. Two targets of a police raid on PRQ this week have been revealed. Authorities still aren't talking, but the boss of the hosting company says one of the seized servers belongs to Sweden's former number two torrent site Tankafetast. The second domain of interest is Appbucket, which appears to be the same site targeted by the FBI during the summer. Meanwhile, the Swedish Pirate Party is basking in a huge spike in member signups as a direct result of the raids. Police carried out a raid against Swedish hosting company PRQ on Monday and the searches were finally completed today. 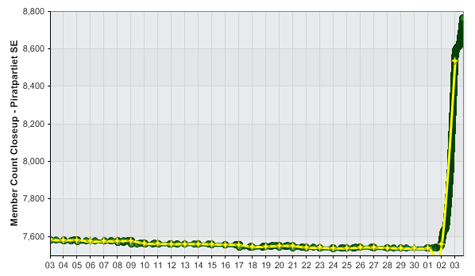 The immediate effect was that all sites hosted on the 80.88./19 net went down, including the torrent sites torrenthound.com, linkomanija.net and tankafetast.nu, release blog RLSLOG.net, and sports streaming sites atdhenet.tv, hahasport.com, sportlemon.tv and stopstream.tv. In all, dozens were affected. The individual sites listed above are now back online, with one notable exception – Tankafetast. As reported earlier this year, Tankafetast was once Sweden’s second largest torrent site but in February decided to call it quits. The closure was prompted by a Supreme Court decision that it would not be granting leave to appeal in the long-running Pirate Bay case and subsequent warnings of a file-sharing site crackdown from Hollywood lawyer Monique Wadsted and Antipiratbyrån lawyer Henrik Pontén. Despite the announcement Tankafetast had remained online until this week, but as confirmed by PRQ owner Mikael Viborg this morning, the police took the site’s server on Monday. “They took three servers, and I know two of the sites that were targets of the raid. The first is Tankafetast.com or Tankafett.com, they are different names for the same site,” he said. “The other is a site called Appbucket.com. It has not been on since April when they stopped paying their bills, so no other customer has taken over the server,” Viborg added. Although Viborg is quoted as referencing Appbucket.com, that site has zero traffic and is owned by Photobucket, Inc., a seemingly unlikely target for a police operation. However, switch to Appbucket.net and things get a whole lot more interesting. That site was the subject of legal action in August when the FBI seized its domain in a crackdown against Android app piracy. It was also hosted by PRQ. The site currently diverts to the familiar ‘seized’ server notice, but its WHOIS entry reveals that it is still registered to PRQ itself, care of none other than Pirate Bay co-founder and former PRQ owner Gottfrid Svartholm. TorrentFreak is currently awaiting further information from Mikael Viborg. Overall, the raids this week generated a lot of interest from web users, particularly as they coincided with The Pirate Bay being offline. The site has now returned, but its interesting to see how many other torrent sites received a boost as a result of its downtime. As can be seen from the member graph below, another direct beneficiary of the raids is the Swedish Pirate Party. After having its server seized this week, Tankafetast redirected its domain to the Party’s Facebook page. “This resulted in a very welcome onslaught of new members,” explains Pirate Party leader Anna Troberg. Authorities are currently refusing to discuss the raids but anti-piracy group Antipiratbyrån confirms that on Monday “50 illegal sites” went offline as a result of the action at PRQ.